Western writers are apt, through their patriotic predispositions, to overestimate the organization, civilizing work, and security of the absolute monarchy that established itself in Rome after the accession of Augustus Caesar. From it we derive the political traditions of Britain, France, Spain, Germany, and Italy, and these countries loom big in the perspectives of European writers. 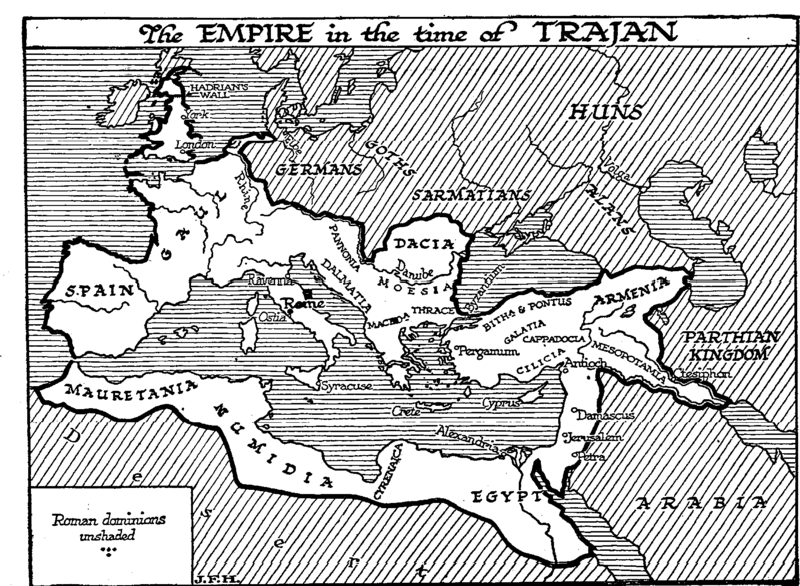 By the scale of a world history the Roman Empire ceases to seem so overwhelmingly important. It lasted about four centuries in all before it was completely shattered. The Byzantine Empire was no genuine continuation of it; it was a resumption of the Hellenic Empire of Alexander; it spoke Greek; its monarch had a Roman title no doubt, but so for that matter had the late Tsar of Bulgaria. During its four centuries of life the empire of Rome had phases of division and complete chaos; its prosperous years, if they are gathered together and added up, do not amount in all to a couple of centuries. Compared with the quiet steady expansion, the security, and the civilizing task of the contemporary Chinese Empire, or with Egypt between 4000 and 1000 B.C., or with Sumeria before the Semitic conquest, this amounts to a mere incident in history. The Persian Empire of Cyrus again, which reached from the Hellespont to the Indus, had as high a standard of civilization; and its homelands remained unconquered and fairly prosperous for over two hundred years. Its predecessor, the Median Empire, had endured for half a century. After a brief submergence by Alexander the Great, it rose again as the Seleucid Empire, which endured for some centuries. The Seleucid dominion shrank at last to the west of the Euphrates, and became a part of the Roman Empire; but Persia, revived by the Parthians as a new Persian Empire, first under the Arsacids and then under the Sassanids, outlived the empire of Rome. The Sassanids repeatedly carried war into the Byzantine Empire, and held the line of the Euphrates steadfastly. In 616 A.D. under Chosroes II, they were holding Damascus, Jerusalem, and Egypt, and threatening the Hellespont. But there has been no tradition to keep alive the glories of the Sassanids. The reputation of Rome has flourished through the prosperity of her heirs. The tradition of Rome is greater than its reality. Augustus Caesar (27 B.C. to 14 A.D.), the Octavian of the previous section, who worked hard at the reorganization of the provincial governments and at financial reform. He established a certain tradition of lawfulness and honesty in the bureaucracy, and he restrained the more monstrous corruptions and tyrannies by giving the provincial citizen the right to appeal to Caesar. But he fixed the European boundaries of the empire along the Rhine and Danube, so leaving Germany, which is the necessary backbone of a safe and prosperous Europe, to barbarism; and he made a similar limitation in the east at the Euphrates, leaving Armenia independent, to be a constant bone of contention with the Arsacids. and Sassanids. It is doubtful whether he considered that he was fixing the final boundaries of the empire along these lines, or whether he thought it desirable to consolidate for some years before any further attempts at expansion. Tiberius (14 to 37 A.D.) is also described as a capable ruler, but he became intensely unpopular in Rome, and it would seem that he was addicted to gross and abominable vices. But his indulgence in these and his personal tyrannies and cruelties did not interfere with the general prosperity of the empire. It is difficult to judge him; nearly all our sources of information are manifestly hostile to him. Caligula (37 to 41 A.D.) was insane, but the empire carried on during four years of eccentricity at its head. Finally he was murdered in his palace by his servants, and there seems to have been an attempt to restore the senatorial government, an attempt which was promptly suppressed by the household legions. Claudius (41 to 54 A.D.), the uncle of Caligula, upon whom the choice of the soldiers fell, was personally uncouth, but he seems to have been a hardworking and fairly capable administrator. He advanced the westward boundary of the empire by annexing the southern half of Britain. He was poisoned by Agrippina, the mother of his adopted son, Nero, and a woman of great charm and force of character. Nero (54 to 68 A.D.), like Tiberius, is credited with monstrous vices and cruelties, but the empire had acquired sufficient momentum to carry on through his fourteen years of power. He certainly murdered his devoted but troublesome mother and his wife, the latter as a mark of devotion to a lady, Poppaea, who then married him; but the domestic infelicities of the Caesars are no part of our present story. The reader greedy for criminal particulars must go to the classical source, Suetonius. These various Caesars and their successors and their womenkind were probably no worse essentially than most weak and passionate human beings, but they had no real religion being themselves gods; they had no wide knowledge on which to build high ambitions, their women were fierce and often illiterate, and they were under no restraints of law or custom. They were surrounded by creatures ready to stimulate their slightest wishes and to translate their vaguest impulses into action. What are mere passing black thoughts and angry impulses with most of us became therefore deeds with them. Before a man condemns Nero as a different species of being from himself, he should examine his own secret thoughts very carefully. Nero became intensely unpopular in Rome, and it is interesting to note that he became unpopular not because he murdered and poisoned his intimate relations, but because there was an insurrection in Britain under a certain Queen Boadicea, and the Roman forces suffered a great disaster (61 A.D.), and because there was a destructive earthquake in Southern Italy. The Roman population, true to its Etruscan streak, never religious and always superstitious, did not mind a wicked Caesar, but it did object strongly to an unpropitious one. The Spanish legions rose in insurrection under an elderly general of seventy-three, Galba, whom they acclaimed emperor. He advanced upon Rome carried in a litter. Nero, hopeless of support, committed suicide. (68 A.D.). Galba, however, was only one of a group of would-be emperors. The generals in command of the Rhine legions, the Palatine troops, and the eastern armies, each attempted to seize power. Rome saw four emperors in a year, Galba, Otho, Vitellus, and Vespasian; the fourth, Vespasian (69-79 A.D.), from the eastern command, had the firmest grip, and held and kept the prize. But with Nero the line of Caesars born or adopted ended. Caesar ceased to be the family name of the Roman emperors and became a title, Divus Caesar, the Caesar god. The monarchy took a step forward towards orientalism by an increased insistence upon the worship of the ruler. Vespasian (69 to 79 A.D.) and his sons Titus (79 A.D.) and Domitian (81 A.D.) constitute, as it were, a second dynasty, the Flavian; then after the assassination of Domitian came a group of emperors related to one another not by blood, but by adoption, the adoptive emperors. Nerva (96 A.D.) was the first of this line, and Trajan (98 A.D.) the second. They were followed by the indefatigable Hadrian (117 A.D.), Antoninus Pius (138 A.D.), and Marcus Aurelius (161 to 180 A.D.). Under both the Flavians and the Antonines the boundaries of the empire crept forward again. North Britain was annexed in 84 A.D., the angle of the Rhine and Danube was filled in, and what is now Transylvania was made into a new province, Dacia Trajan also invaded Parthia and annexed Armenia, Assyria, and Mesopotamia. Under his rule the empire reached its maximum extent. Hadrian, his successor, was of a cautious and retractile disposition. He abandoned these new eastern conquests of Trajan’s, and he also abandoned North Britain. He adopted the Chinese idea of the limiting wall against barbarism, an excellent idea so, long as the pressure of population on the imperial side of the wall is greater than the pressure from without, but worthless otherwise. He built Hadrian’s wall across Britain, and a palisade between the Rhine and the Danube. The full tide of Roman expansion was past, and in the reign of his successor the North European frontier was already actively on the defensive against the aggression of Teutonic and Slavic tribes. Marcus Aurelius Antoninus is one of those figures in history about which men differ widely and intensely. To some, critics he seems to have been a priggish person; he dabbled in religions, and took a pleasure in conducting priestly ceremonies in priestly garments-a disposition offensive to common men-and they resent his alleged failure to restrain the wickedness of his wife Faustina. The stories of his domestic infelicity, however, rest on no very good foundations, though certainly his son Commodus was a startling person for a good home to produce. On the other hand, he was unquestionably a devoted and industrious emperor, holding social order together through a series of disastrous years of vile weather, great floods, failing harvests and famine, barbaric raids and revolts, and at last a terrible universal pestilence. Says F. W. Farrar, quoted in the Encyclopaedia Britannica, «He regarded himself as being, in fact, the servant of all. The registry of the citizens, the suppression of litigation, the elevation of public morals, the care of minors, the retrenchment of public expenses, the limitation of gladiatorial games and shows, the care of roads, the restoration of senatorial privileges, the appointment of none but worthy magistrates, even the regulation of street traffic, these and numberless other duties so completely absorbed his attention that, in spite of indifferent health, they often kept him at severe labour from early morning till long after midnight. His position, indeed, often necessitated his presence at games and shows; but on these occasions be occupied himself either in reading, or being read to, or in writing notes. He was one of those who held that nothing should be done hastily, and that few crimes were worse than waste of time». But it is not by these industries that he is now remembered. He was one of the greatest exponents of the Stoical philosophy, and in his Meditations, jotted down in camp and court, he has put so much of a human soul on record as, to raise up for himself in each generation a fresh series of friends and admirers. With the death of Marcus Aurelius this phase of unity and comparatively good government came to an end, and his son Commodus inaugurated an age of disorder. Practically the empire had been at peace within itself for two hundred years. Now for a hundred years the student of Roman history must master the various criminology of a number of inadequate emperors while the frontier crumbled and receded under barbarian pressure. One or two names only seem to be the names of able men: such were Septimius Severus, Aurelian, and Probus. Septimius Severus was a Carthaginian, and his sister was never able to master Latin. She conducted her Roman household in the Punic language, which must have made Cato the elder turn in his grave. The rest of the emperors of this period were chiefly adventurers too unimportant to the general scheme of things for us to note. At times there were separate emperors ruling in different parts of the distracted empire. From our present point of view the Emperor Decius, who was defeated and killed during a great raid of the Goths into Thrace in 251 A.D., and the Emperor Valerian, who, together with the great city of Antioch, was captured by the Sassanid Shah of Persia in 260 A.D., are worthy of notice because they mark the insecurity of the whole Roman system, and the character of the outer pressure upon it. So, too, is Claudius, «the Conqueror of the Gotha», because he gained a great victory over these people at Nish in Serbia (270 A.D.), and because he died, like Pericles, of the plague. Through all these centuries intermittent pestilences were playing a part in weakening races and altering social conditions, a part that has still to be properly worked out by historians. There was, for instance, a great plague throughout the empire between the years 164 and 180 A.D. in the reign of the Emperor Marcus Aurelius. It probably did much to disorganize social life and prepare the way for the troubles that followed the accession of Commodus. This same pestilence devastated China, as we shall note in sec 4 of this chapter. Considerable fluctuations of climate had also been going on in the first and second centuries, producing stresses and shiftings of population, whose force historians have still to appraise. But before we go on to tell of the irruptions of the barbarians and the attempts of such later emperors as Diocletian (284 A.D.) and Constantine the Great (312 A.D.) to hold together the heaving and splitting vessel of the state, we must describe something of the conditions of human life in the Roman Empire during its two centuries of prosperity.